Who has two thumbs and left their Smashbox primer in an Austrian hotel room? I can't really say I'm gutted since I wasn't a big fan of it (as this review will testify) but I am pretty annoyed I left a £23 bloody primer in a different country. Oh well, onwards and upwards. 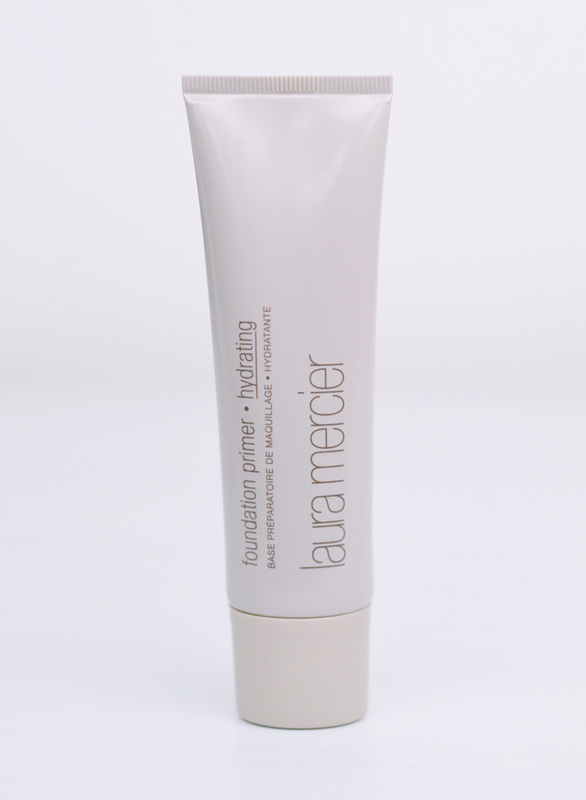 When I was canvassing recommendations on great primers for dry skin, Laura Mercier Hydrating Foundation Primer came up a lot, so I decided to use my loss as an opportunity to try it out. It's better than the Smashbox one, that's for sure! I'm not particularly enamoured with the tube. It's fairly long, so it barely fits in my make up bag, and it doesn't even seem to need to be this long. The lid is chunky, the nozzle is big, the tube is a lot thinner than it could be... It almost seems like it's purposefully been designed to take up as much space lengthwise as possible. Nevertheless, it looks pretty sleek with this iridescent oyster colour so there's that, I guess. Oh my word, this is so much nicer than the Smashbox primer! Almost a gel-like consistency, it's a thick white liquid with a much more subtle fragrance. There's still a chemical or alcohol tinge to it but it's a lot less pungent than Smashbox. As I apply it, the primer is absorbed quickly and dries really speedily, without leaving residue on the skin. Once this primer has been applied, it leaves a smooth, even and dewy surface without greasiness. It's not quite as smooth a result as Benefit Porefessional, but it's still an easier surface to work on. True to its promise, it's also really hydrating but doesn't leave me feeling like I'm just wearing an extra moisturiser. Since using this primer, I've noticed that the dry patch on my cheek has stayed well away and my foundation has been looking much more even. This was definitely a better option than Smashbox. Perhaps it was divine intervention from the make up gods! This sounds amazing, I've never tried anything from LM but this is definitely worth the try! Ooh this sounds good! :) I will have to remember to give it a go once I have some pennies saved up!